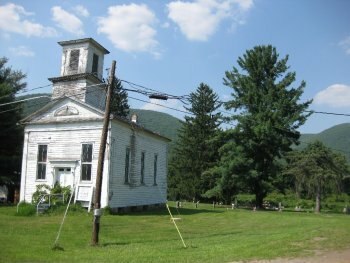 Caption: Erected in 1840 as a Presbyterian church, this now unused edifice, with its cemetery containing some of the early to mid-19th century pioneers, stands at the northwest corner of Route 6 and Marsh Creek Road at Ansonia, just a few hundred yards west of the Pine Creek Rail Trail and where Marsh Creek empties into Pine Creek. William E. Dodge, of the lumber mill business--Phelps, Dodge & Company--was mainly responsible for the construction of the church. Its cemetery contains some early pioneers, including Israel Merrick, Sr. (1805-44). As I walked around the burial ground, taking a break from my August 31th bicycle ride along the northern section of the rail trail (having parked my car eight miles away at the northern terminus at Stokesdale Junction), I photographed several interesting tombstones, including those of two young children (Addie D. and Earle W. Fowler, ages 6 and 5, respectively), who drowned together on June 10, 1892; a sister and brother, Nancy and Leonard Herrington, who died in 1843 and 1846, at the ages of 25 and 13, respectively; and a man named Joseph A. Darling, recorded as having been "killed by the cars," no doubt New York Central rail cars, on August 19, 1899.